Sean Fankhauser began teaching meteorology and climate at Fernbank Science Center in August, 2015. He teaches Atmospheric Science for Fernbank’s STT program for 9th graders, climate and weather programs at Fernbank for visiting schools, and a variety of outreach programs involving weather and physical science primarily for elementary and middle schools in the DeKalb County School System. Sean grew up in Gainesville, GA, and has always been fascinated by the power and beauty of weather. 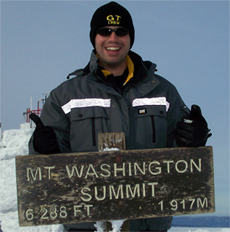 At Georgia Tech, he earned his BS and MS in Earth & Atmospheric Science. Prior to his teaching career, Sean worked behind the scenes as a meteorologist at The Weather Channel. While living in Boston for a few years, Sean worked at the Museum of Science where he had the privilege of electrifying audiences with the world’s largest air-insulated Van de Graaff generator! Sean also worked as a weather observer for a few years at the Blue Hill Weather Observatory in Milton, MA, home of the nation’s oldest climate record. Sean also helps coordinate Fernbank Science Center’s participation in the annual Atlanta Science Festival.